Fort Reno had its origins as a temporary camp in July 1874 to protect the Cheyenne-Arapaho Agency at Darlington following an Indian outbreak that led to the Red River War of 1874. Sited three miles west and two miles north of present El Reno in Canadian County, the original military camp was enlarged and officially created as Fort Reno on July 15, 1875. It took its name from Gen. Jesse L. Reno, who had been killed at South Mountain, Maryland, during the Civil War. Fort Reno was assigned to exercise military control over the Southern Cheyenne and Southern Arapaho Reservation.It stretched westward between the North Canadian and Washita watersheds to the Texas Panhandle. The post and the Darlington Agency fostered the first trappings of white settlement in what is now central Oklahoma. A severe test of the fort's purpose came in 1878 following the arrival of Northern Cheyenne at the agency. When a large number of their group died from disease and inadequate food and medical care, a portion of the northerners under chiefs Dull Knife and Little Wolf fled from the reservation and began a precarious trek back to their homeland. Two troops of Fort Reno cavalry under Capt. Joseph Rendlebrock pursued the bands and contested the Cheyenne on several occasions. The Cheyenne retreat was the subject of Mari Sandoz's classic book Cheyenne Autumn. Another call to duty came in the 1880s with the Oklahoma boomer invasion under David L. Payne. Fort Reno's Ninth Cavalry Buffalo Soldiers and Indian scouts played a major role in searching for and arresting those who illegally entered the area. Troops of the Fifth Cavalry also monitored the opening and signaled the start of the historic Land Run of 1889 into the Unassigned Lands of Central Oklahoma. They and the Third Cavalry acted in a similar fashion for other openings, notably that of the Cheyenne-Arapaho Reservation in 1892 and of the Cherokee Outlet in 1893. Fort Reno troops served in other police actions as well. A crisis had developed during the 1880s concerning Texas livestock that were driven across the Cheyenne-Arapaho Reservation and also concerning the leasing of pastureland to Texas cattlemen. One of the most serious incidents involved a Texas drover named E. M. Horton. In May 1884 he shot and killed a Cheyenne Dog Soldier who resisted when Horton's horses ran across his garden patch. This and complaints by Cheyenne leaders brought Gen. Philip H. Sheridan to Fort Reno to resolve the matter. Sheridan ruled in favor of the Indians and ordered all Texas cattle removed from the reservation, an action that involved Fort Reno soldiers. By the end of the nineteenth century Fort Reno's mandate as a guardian of peace on the Indian frontier had faded, leaving the fort without a strong purpose for existence. The situation became even more severe when virtually all of its cavalry and infantry force-marched away to serve in the Spanish-American War of 1898. Though lightly regarrisoned after the war with First, Sixth, and Eighth Cavalry units (until 1902), and thereafter with Ninth, Twenty-Fifth (African American) and Thirtieth Infantry, the post finally closed as an active military base in 1908. That same year the U.S. Army reactivated the fort as a remount station at which troopers trained cavalry horses and mules for military use. Under the leadership of commanders such as Capt. Lecher Hardeman, Maj. Henry Weeks, and Maj. Edward M. Daniels the post was refurbished and expanded. Soon its pastures were filled with thousands of horses and mules that were groomed and trained for military duty in both world wars and Korea and for use by other governments in their fight against communism. A special feature of the Fort Reno Remount Station was its polo competition, conducted by Capt. C. A. Wilkinson and Maj. William A. Ranck. During September 1929 polo enthusiast Will Rogers visited Fort Reno to attend a meet. In 1948 Fort Reno was transferred to the U.S. Department of Agriculture, which in coordination with Oklahoma A&M College (later Oklahoma State University) established a Livestock and Forage Research Center there that same year. Interred in the Fort Reno cemetery are the remains of pioneer citizens, military personnel, victims of the Northern Cheyenne outbreak, and World War II German prisoners. One of the most notable grave markers is that of Ben Clark, the longtime frontier scout who served Custer and Sheridan. 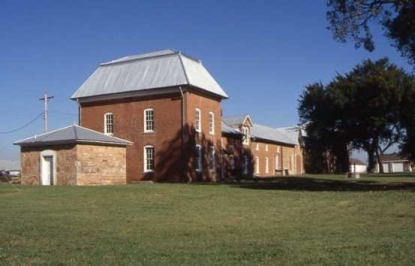 Fort Reno was listed in the National Register of Historic Places in 1970 (NR 70000529). Still standing is the post chapel, constructed by members of Hitler's Afrika Korps. The history of this illustrious frontier military post has been preserved in a Visitor's Center exhibit of photos and memorabilia. W. Edwin Derrick, "Fort Reno: Defender of the Southern Plain," in Early Military Forts and Posts in Oklahoma, ed. Odie B. Faulk, Kenny A. Franks, and Paul F. Lambert (Oklahoma City: Oklahoma Historical Society, 1978). Stan Hoig, Fort Reno and the Indian Territory Frontier (Fayetteville: University of Arkansas Press, 2000). Stan Hoig, "Fort Reno," The Encyclopedia of Oklahoma History and Culture, https://www.okhistory.org/publications/enc/entry.php?entry=FO037.